After moving to Los Angeles in 1915 and establishing The Brotherhood of Light Elbert Benjamine’s next task was to recruit members. This required advertising and the production of free educational literature explaining the B of L information product. One of the pamphlets he produced, which was sent to prospective members who ‘might become interested in the work’, was entitled Essential Spiritual Doctrines. The original article is presented here with slight changes to make it more culturally relevant in 2013. Because a thing is ancient it is not necessarily valuable. In fact, ancient implements, ancient customs, and ancient methods of work have in general been discarded because they are less satisfactory than those now employed. The world moves forward to better things. And the progress upon which we so pride ourselves demands that old beliefs be discarded when found to be at variance with demonstrated scientific fact. We live in an age of specialization, and therefore can appreciate the advantages such specialization brings. If we need help for our eyes we go to an eye specialist. If something goes wrong with our car, we take it to a man specializing in repairing that particular model. The world as a whole now specializes in mechanical contrivances and computer technology, and the best brains are devoted to research in material science. When we want the best obtainable information we consult a specialist in that line. He has had advantages to learn about it not shared by others. In ancient times, as there is ample evidence to show, the best brains were devoted to spiritual research. That is, there was a period at some time in the distant past when the faculties of the best trained minds were directed, not as now toward mechanical inventions, but toward learning the nature of the human soul and its proper relation to the rest of the universe. Such intensive research, aided by the development of unusually sensitive psychic faculties, as now research requires the development of unusually sensitive mechanical instruments, we have reason to believe, was carried on by specially trained men over a long period of time. The result was an era of spiritual enlightenment. Even as present day specialization has given rise to what is termed the computer age, so the specialization of that day gave rise to what tradition calls the Golden Age. If tradition of the wisdom of that day were all we might possess, there is no need for its further consideration. But its doctrines, the result of the findings of these spiritual specialists, still exist. Just because they are the opinions of specialists does not signify that they are sound. In this age of intellectual enlightenment we are not warranted in accepting the findings of specialists, ancient or modern, without experimental demonstration. But at least the findings of specialists should be given the benefit of subjecting them to proof. And amazing as it will seem to some, the doctrines of the Golden Age, when critically tested by the most approved methods of science, are found to be of sterling worth and untarnished value. In the 48 pictured constellations these spiritual masters of the Golden Age recorded in the sky the result of their researches. Making these records for future generations, they employed the most primitive form of writing in the world. They used pictographs, such as are used by primitive peoples almost everywhere. Pictures, for instance, are found inscribed on rocks throughout western America, as the form of writing employed by American Indians. Each of these 48 pictures that adorn the sky represents some great spiritual truth. Each is a definite pictograph of some moral relation. Each, therefore, is the subject for a complete sermon; and together they embrace a science and philosophy of life, every tenet of which may be put to the test and found true. Because the moral doctrines and natural laws embraced in this science and philosophy are pictorially represented by the constellations, the system as a whole is called The Religion of the Stars. The ancient masters were at immense pains that the spiritual ideas they had discovered should not be lost to following generations. They traced them as pictured constellations, about which myths and allegories were woven to still further explain their meaning. These stories and traditions found their way into sacred books of various lands. Other pictures, representing the same spiritual ideas, were engraved on tablets, and later on metal plates, and finally found their way on to cards. These cards, emblazoned with the symbols of the ancient spiritual doctrines, came to be known as the Sacred Tarot; and from them through modification we have derived the common playing cards. Later, written records were subject to vandalism. And for hundreds of years during the dark ages of man's religious history there was a relentless effort to destroy all records, all teachings, and even the statuary and monuments of the past. Records that were too large to be destroyed in the common manner when possible were buried, as was the Aztec Calendar Wheel. Friar Alonso de Montufar caused this stone record weighing some 24 tons to disappear. But while excavating in the Plaza Mayor over 200 years later, workmen accidentally uncovered it, and it is now in the Mexican National Museum, an eloquent spokesman of the great astronomical and spiritual learning of the Aztecs. Today in addition to the pictured constellation and the pictured cards, and the myths and legends of the past, we also have, so numerous as to be beyond calculation, huge stone monuments erected by prehistoric peoples. They remain to us because they are so huge, and so numerous, that their removal or destruction was beyond the powers of the vandals. They are found in a belt extending entirely around the world. In England, France, Egypt, Mesopotamia, India, Peru, Mexico, and the United States, these stupendous stone records of the beliefs of an ancient people exist. Thousands of such monuments too large to be obliterated by later people persist. 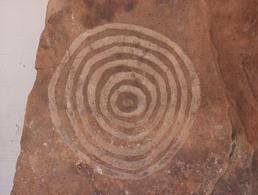 They are of four distinct forms, and even as the constellations, and the pictures on playing cards, reveal to one conversant with such picture-writing the ideas attached to them, so each of these types of the huge ancient stone monuments reveals by its form the spiritual idea it conveyed to the minds of the people who erected it. Furthermore, because these types of structures were erected to perpetuate in physically enduring material the four dominant doctrines of the Religion of the Stars, they may not only be explained by means of universal symbolism, but the constellation in the sky that still further exemplifies the same idea may easily be pointed out. 1. The Dome Shaped Mound: These dome shaped mounds were used for magical ceremonies and for initiations. They are so used today by primitive peoples, the kiva of the Indians of the Southwestern USA being a single example of many that may be cited. Such a dome by its shape is a universal symbol of the feminine in Nature. It represents the same principle that the root 'Ma' does in various languages, that is, it signifies mother. The Sun, chief astrological index, is in the sign Taurus in the time of Ma(y). Taurus is also the exaltation, or the highest station, of the mother planet, the Moon. It is an earthy sign; hence the mound while hollow and having a small bow entrance is usually covered with earth. The first quadrant of the heavens is symbolized by Taurus, the Bull, with which the mighty Hunter Orion, is pictured in perpetual conflict. Orion wields the club of mental power to combat and overcome the bull that pitches down upon him from the sky. The bull with which the hunter struggles, and which mythology and the Bible inform us was thus overcome, signifies the sum total of our environment. The bull is the symbol of the most earthy zodiac sign; hence represents physical obstacles and limitations to be overcome. Pitching down upon Orion from the sky also signifies those influences that come from the sky. The club is intelligently directed will power. Thus is conveyed the idea that both material conditions and the influence of the stars may be overcome by the use of the mind of man. It is in these dome-shaped mounds that primitive peoples carried out ceremonies to make them successful in the hunt, to give them a successful harvest, to overcome enemies, and to enter into communicator with the dead. That is, these were the places where they went to 'demonstrate success' through the exercise of the mind's hidden powers. This sign Taurus, as mentioned, is the exaltation of the Moon. The Moon is the orb that rules the unconscious mind, which is the instrument through which thoughts manifest their supreme power. Both the mound-shaped dome and the pictured constellation record the belief of some ancient people that man, through the proper exercise of his mentality, can control his own life and destiny, here and here-after. 2. The Upright Pillar: Huge straight shafts of rock upright like the rays of the midday Sun symbolism the virile masculine powers of Nature. In the zodiac the sign over which the Sun has special rule is Leo, pictured by a lion. The Lion is noted not merely for his courage but for his affection. The house it naturally rules in a birthchart is the one concerned with pleasures, love affairs and children. Love and life are closely allied, and the upright pillar and the sign Leo symbolism both virility and love. Doctrines that teach asceticism, that teach sadness and sorrow, that inflict pain, and pronounce legitimate pleasure sinful are opposed to all the findings of modern psychology. The love of husband for wife and of wife for husband is a most holy and sacred thing, and is one of the most constructive forces that man can utilize. The love of parents for their children approaches the deific in its sanctity, and it germinates the seed of that unselfish love that alone makes immortality possible. 'Do unto others as you would have others do unto you' is one of the most important doctrines ever taught, and is based upon the admonition, 'Love ye one another'. It is love that binds together. Love is the universal constructive agent. That which encourages and nourishes true love is blessed and should endure, for when love leaves the vacancy is filled by selfishness. The second quadrant of the heavens is symbolized by the Lion. And this constellated lion, as likewise the single shafts of stone erected in veneration of creative energy, both record the belief of some ancient people that love lies at the foundation of all constructive effort. 3. The Horizontal Slab Supported by Two Pillars: These massive tables of stone supported by |two or more pillars present the form of a doorway. But they are more than doorways, for the conspicuous feature of their structure is the flat, table-like surface presented by the slab held thus high off the ground. It strikes the eye at once as a plane. This plane is obviously one above the earth. It is a higher plane. And the doorway also is to no physical habitation. A doorway thus connected to a plane higher than the earth has but one message in the language of universal symbolism. It is a pictograph, so to speak, signifying that there is a plane of endeavor above the physical, and that death is but a passing through a doorway to a life in spiritual realms. The third quadrant of the heavens is symbolized by Scorpio. This zodiacal sign is commonly represented as a crawling denizen of the desert, the scorpion; but as representing another influence of the same sign is pictured an eagle, master of the element above the earth. To the quadrant as a whole is represented by the eagle. The house it naturally rules in a birthchart is the home of death. Not only then, does the huge slab of stone supported by to pillars attest to a belief in a survival of the personality after death; but by expressing the relation of man to death as a Scorpion that becomes an Eagle, an ancient race portrayed the conviction that through death man ceases to crawl in the dust and soars to a life of greater power and freedom. 4. Concentric Circles: A circle of huge stones, and within these, over circles of huge stones about the same centre, portray be orbits of the planets. The picturing in so many parts of the world of the movements of the planets, at a cost of so great labor would have been undertaken only because it was believed the movements of the planets thus represented have a profound influence upon the life and destiny of man. The man of the zodiac, Aquarius, picturing the fourth quadrant of the heavens also speaks in unmistakable term of the same belief. Water running from his urn flows down upon the earth even as do the vibrations from the planets. And in one hand he holds aloft, as if measuring the influences in the firmament above, a 24-inch gauge, even as astrologers past and present use the 24-hour period as the measure of astrological influences meted out to man. Thus we find huge stone monuments, called cromlechs, built by a people of whom history holds no record, yet speaking to us in the simplest form of written language, the pictograph. And these stone structures bring the same message that is revealed by the constellation of the Man. They attest to a belief that the planets have an influence over human life and destiny. Not because these four doctrines were believed in by the Ancients, but because they are today demonstrated to be true, they should be brought to the attention of as many people as possible – Essential Spiritual Doctrines for today's Hi-Tech World.